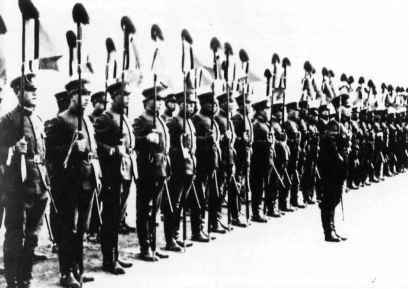 By 1930 the Nationalists' victory had brought about a certain amount of order to China, and this was reflected in the better dress of the bulk of the army. Rank insignia was introduced which consisted of collar patches in the branch colours and a series of gold triangles - from one for a private 3rd class to three for a private 1st class. The next ranks up had a black line behind the triangles - from one triangle for a corporal to three for a first sergeant. 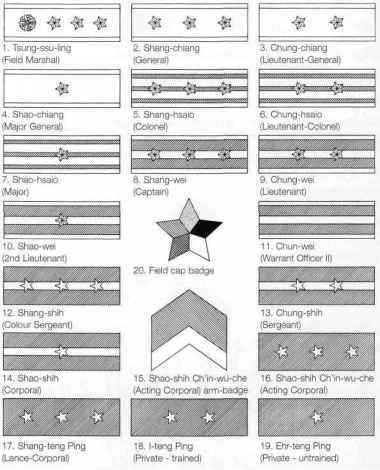 The next ranks up had a gold line behind the triangles - from 2nd lieutenant to captain, then two gold lines from major to colonel and finally the highest ranks had a gold background with one, two or three triangles going from major-general to general (see Table 3). In the early 1930s two basic uniforms were worn by the rank and file of the Nationalist Army. 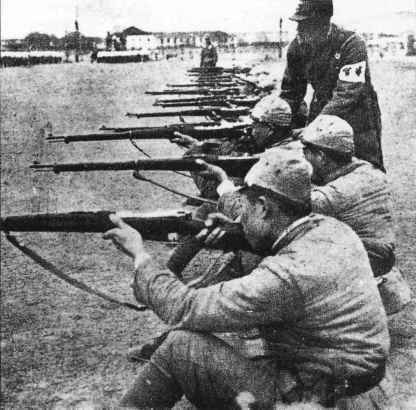 The Northern troops that first faced the invading Japanese wore grey padded cotton uniforms with either fur hats, old-style peaked caps or a field cap similar in shape to a French 'kepi'; all hats had the Kuomintang sun emblem. 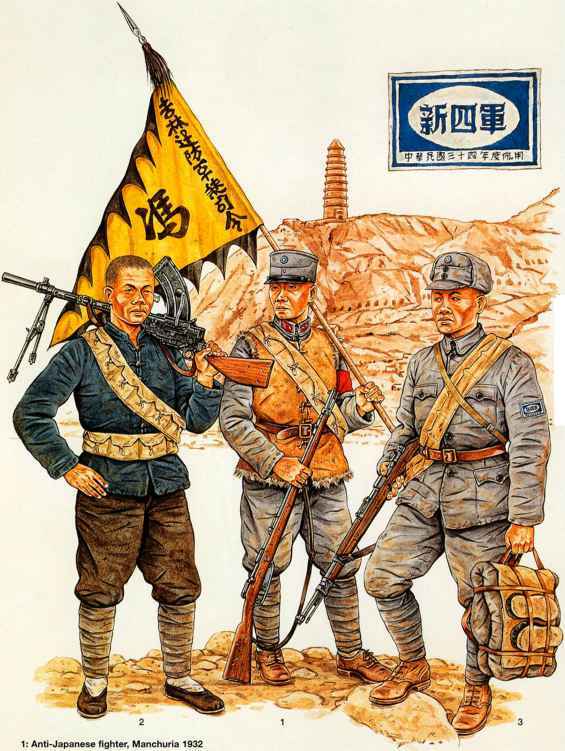 The southern Nationalist uniform became the standard uniform after the defeat of the northern armies in the fighting against Japan in the early 1930s. There were two versions of the southern uniform — summer and winter. The summer uniform consisted of a light cotton khaki jacket which went from light khaki in colour to mid-brown, with many variations depending on local supplies. Jackets usually had two breast pockets and two waist pockets with five buttons down the front of the tunic and a stand and fall collar which carried the rank insignia. Above the left breast pocket was a unit patch which had a border in the branch colour - red for infantry and yellow for cavalry etc. Trousers were either breeches or long shorts in cotton and were worn with woollen puttees that came up to the knees. Headgear was either a field cap of the 'ski' type or a steel helmet, which came in various patterns. Winter uniforms were made of padded or 'wadded' cotton material and were blue-grey in colour. They are usually described as blue uniforms that have faded, but this was not always the case: some would have been made from grey material. The padded jacket and trousers gave the wearer a 'podgy' and ungainly look but were quite effective at keeping him warm. Steel helmets became more widely used during the 1930s, and by 1937 they were in quite widespread use in the Nationalist Army. Helmets came in a variety of types, including the German 1935 model, the French Adrian and both the British and American World War I models. Three types of Chinese-produced helmets were also in use; two were based on early Japanese helmets and one was a 'Pith'-type helmet similar to that worn by the Viet Cong in the Vietnam War. 1: Gold shoulder-bars piped gold, 3 gold stars, 1 gold orchid. 2-4: Gold shoulder-bars piped gold, 3-1 gold stars. 5-7: Maroon shoulder-bars piped gold, 2 gold stripes, 3-1 gold stars. 8-11: Maroon shoulder-bars piped gold, 1 gold stripe, 3-0 gold stars. 12-14: Maroon shoulder-bars, 1 gold stripe, 3-1 gold stars. 15: Red (upper) gold (lower) arm-badge. 16-19: Maroon shoulder-bars, 3-1 yellow stars. 20: Five-coloured cap-badge - clockwise yellow (top) - black - white - blue - red. Branch-colour collar-patches: Infantry - scarlet: Cavalry - light green: Artillery - yellow: Engineers -brown: Service Corps - dark blue: Supply - silver-grey: Medical - dark green:Veterinary Corps - purple: Legal Services - white: Band - blue: Airforce - light blue: Gendarmerie - black. Note. Shoulder-bars 2-14, 16-19 were worn by personnel of the Inner Mongolian Army (Men-ku Chun) November 1937 to August 1945, with Mongolian mid-blue replacing Manchukuo maroon. the mid-1930s till 1949. They were still being worn in the Civil War even though the American Ml was the standard model by that time. French Adrian helmets were mostly worn by troops in the provinces bordering French IndoChina and by the 19th Division, which was an American-trained division. All helmets had the Nationalist sun emblem on the left side of the helmet or on the front, and some of the French Adrian models had a badge on the front with the sun emblem in the centre of a wreath. After the outbreak of World War II Chiang's American allies began to supply the Nationalists large amounts of aid in the form of equipment and advisers. The Americans persuaded Chiang to send 20 divisions to India to be trained to fight in Burma on the Allied side. The troops were trained and equipped by the Americans and British and wore a mixture of their cast-off uniforms with American Ml or British helmets. 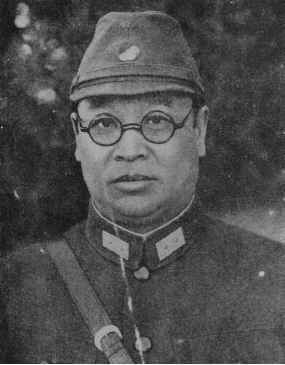 When the Japanese were defeated they were airlifted back to China to become a useful addition to the Nationalist forces in the Civil War. The officer's service uniform was khaki, usually wool, and consisted of a field cap of the German 'ski' type with the Nationalist sun emblem. On the single-breasted jacket were two breast pockets and two waist pockets with the rank shown on the collar by the usual rank patches. Trousers were of a Western style, worn without puttees, although in the field, officers would often revert to their breeches and puttees. Air force personnel were part of the army and wore the same basic uniform as army officers but with different rank insignia, worn on the collar and cuffs of the jacket. Air force officers wore a peaked cap similar to the US model, which was later adopted by army officers as well. Chan-shih gold stripes with three flower blossoms above and two gold rings above them. Officers also wore ceremonial daggers or dirks, which were similar to the type worn by the various German armed forces and political groups in the 1930s and 1940s.